This is a fine 1958 U.S. Air Force aeronautical chart or map of Mt. Victoria and vicinity. 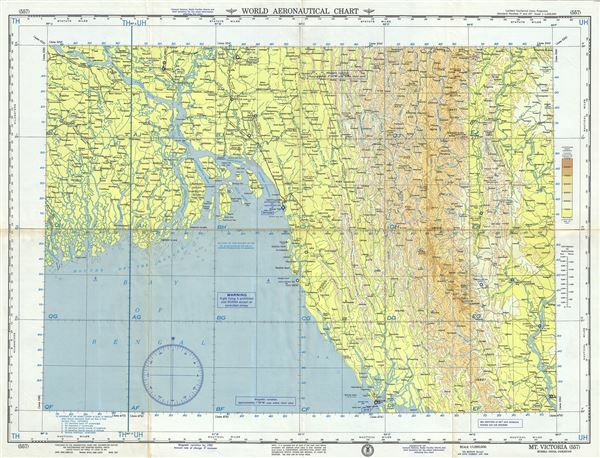 It covers the Ganges River Delta from Jessore in modern day Bangladesh (which was part of Pakistan when this map was made) east to Magway and the Irrawady River in Burma or Myanmar including part of southern Mizoram in India. The map is highly detailed, noting warnings, important cities, towns, rivers, roads, railroads as well as other hydrographical and topographical features essential for the air pilot. Mount Victoria or Khaw-nu-soum, in the Chin State of western Burma or Myanmar is included. Verso of this chart features legends and a world aeronautical chart index. This chart was published by the USAF Aeronautical Chart and Information Center, and was issued as chart no. 557. First issued in 1946, this is the ninth edition revised to April 1958.